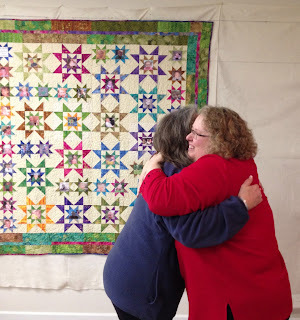 Lucy's Quilts: What a Fun Night! But then, it is always fun at craft night. Tuesday was especially great though because it was Quilt Reveal Night! It is always so exciting to see what creations we came up with this year. I drew the #1 so I went first to reveal the quilt I made for my friend, Nadine. She seemed to like it...I was so honored to make this for her. As I cut the pieces and sewed the blocks I was given the opportunity to pray for Nadine and the success of her treatment. Next came Linnea's quilt for Cindy. In the center of the stars are pictures of all of Cindy's grandkids. Sally our hostess was the next to hang her quilt. This time for Mary. 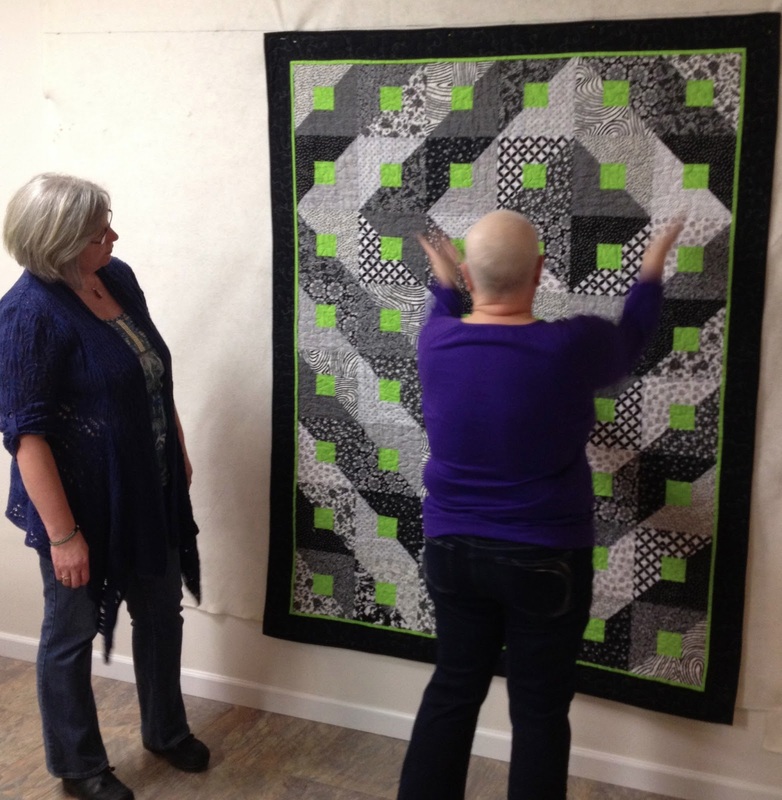 We got to watch this quilt come together. You can't see it in the picture but the colors in this looked so soft - almost as if it was flannel. Then Linnea left the room so Mary could hang up some of the blocks for Linnea's quilt. 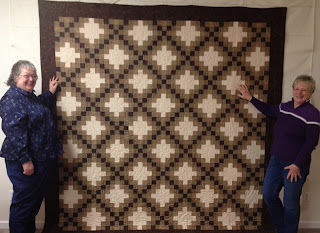 Evidently Mary made two other quilts but wasn't satisfied with them so she decided on this one. She had hoped to have at least half of it put together for the reveal but there was a good bit of unsewing that needed to be done so it just wasn't to be. It is going to be gorgeous when it gets finished. Next up was Nadine's quilt for me! It is great! 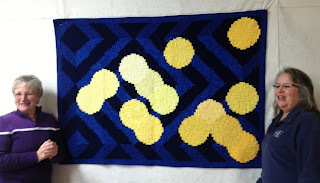 Now I don't have to make my own black and white quilt with a splash of color! 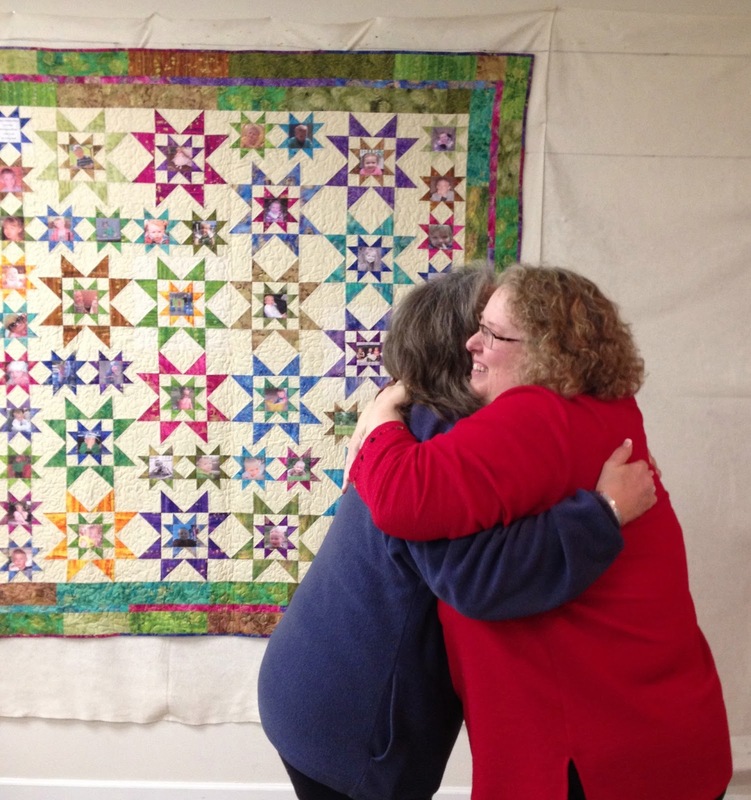 Our last quilt was Cindy's quilt for Sally. She struggled so with this quilt. She was very proud of herself for actually following the pattern but some of the strips were mighty thin. All the quilts were so awesome! After we finished oohing and aahing we got down the business of figuring out who will be making a quilt for whom. We each just have two more people to make quilts for now, so we figure we will just work on them both, but only one is expected to be finished by May 2014. My first needs to be made for Mary. 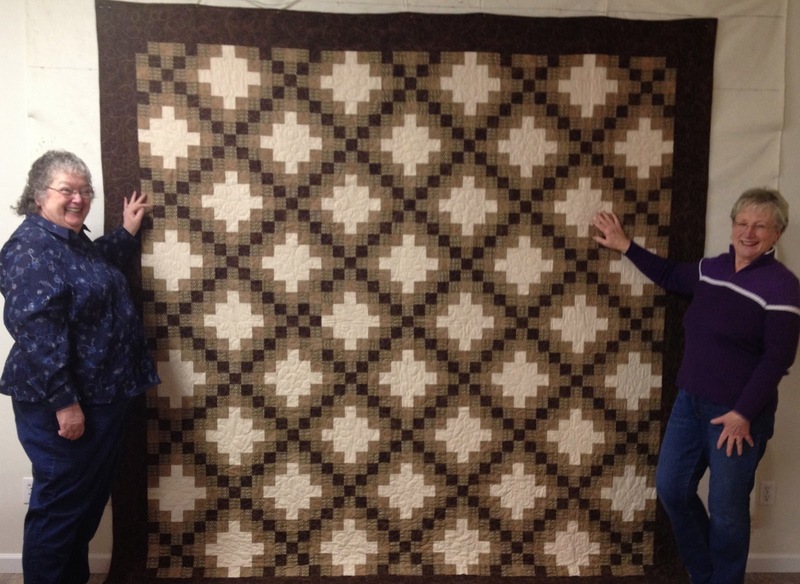 She is fine with any size and is interested in Black and White with a bit of Red and does like Log Cabin or any more traditional quilt. I will need to look at patterns and see what I come up with. I am hoping to get it done sooner rather than later and then I can get to work on one for Cindy. The log cabin quilt with all the blues is a wonderful piece. It would look good in my bedroom.